ZN replica 5cc car body in polished aluminium (Orders Taken?). I have now made six of these very nicely proportioned sports car type bodies by hand almost exactly as the originals must have been made by partial presswork and hand beating. 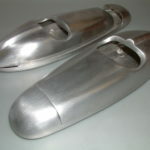 They are made in two main pieces the pan, or bottom half with the nose welded on and the top with cockpit left open for access to the engine and exhaust. The top is made in heavier 16 guage material for durability, as originals in 20g did crack. They are hand filed and finished ready for painting, or further polishing and matched to a good joint. The body comes with a ZN badge to mount on the nose, plus two M3 rivet nuts and screws to secure the body. A drawing will be supplied. The price reflects the large amount of work in making the tooling as well as the bodies themselves and finally filing and polishing to an acceptable standard after hand shaping and beating. This entry was posted in Model Car by admin. Bookmark the permalink.